It looks like a nice route for 2011. I will not be going on the BAK this year. Last year was fun, but I ended heading off on my own, about half way, to avoid the crowds. I had sandwiched the BAK last year so I was self contained. So when the weather turned bad it was easy for me to head off on my own where I good go at my on pace and have better facilities. This year I was considering to do the standard BAK but instead, I am now planning to do a "Discovery" trip of my own. Solo Touring self supported, through the past. The "Past" may include a part of the BAK route, so I am deciding now if the dates may work to ride a little with the group (50 miles or so). 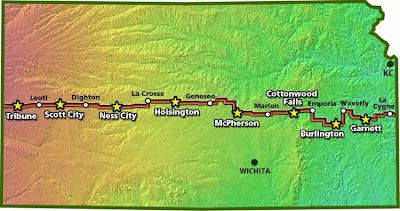 My route will be a Cimarron, Dighton, Lacrosse, Kinsley, Dodge City and back to Cimarron to complete the circle route. Groups are nice and have advantages, but sometimes Solo Touring is called for. Solo touring takes a little more planning but it does give flexibility when the need arises. oh....and it is much easier to find a place to eat and an unoccupied restroom facility.! But for those going on the BAK, have a great trip..... and I may see you on the road. 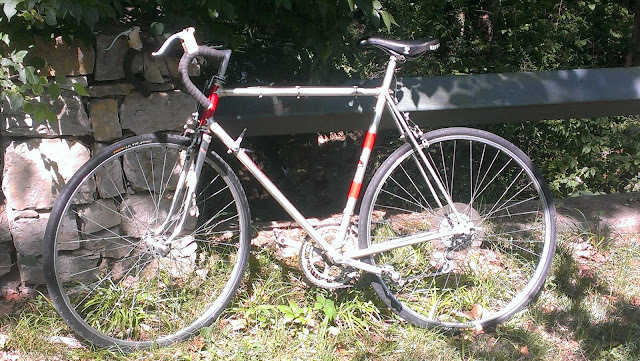 I will miss hearing "on your left" over and over again as the "go fast" bikes go around my fully loaded touring bike. Hope to see you on the road !